Owned by Lakewood Development Corp. and operated by non-profit Strand Ventures, Inc., located in downtown Lakewood. 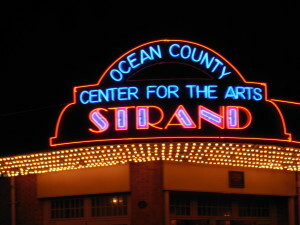 First opened as Strand Theatre 1922, designed as theater to attract pre-performance bookings of Broadway shows, along with presenting silent pictures and vaudeville acts. Nationally known acts included Milton Berle, Ray Bolger, George Burns and Gracie Allen, more contemporary performers include Louie CK, Taylor Swift, Charlie Daniels. Ended live performances in 1930s to show only movies, added to National Register of Historical Places in 1982 and re-opened for live productions in 1984. Live entertainment includes concerts, dance, musicals, and theater, comedy performances. Also hosts arts education programs and theater camps for children and teens. Located on campus of Ocean County College. Hosts Garden State Philharmonic as Orchestra-in-Residence, also home of Ocean County College Theatre Company and Ocean County College Concert Band. Supported by $5 million grant from Grunin Foundation to promote arts and culture in Toms River region. Opened 1976, 550-seat theater on campus of Stockton University 12 miles west of Atlantic City. Activities include concerts, community convocations, lectures, recitals, film and video presentations. Hosts ballet, modern and contemporary dance troupes; classical, jazz and popular orchestras and opera as well as musical theatre, drama and comedy. Performances include those by Glenn Miller Orchestra, John Sebastian of the Lovin’ Spoonful, Irish Rovers, La Compania Flamenca and The Jersey Four (Tribute to Frankie Valli and the Four Seasons). Some productions include participants from Stockton’s Student Entertainment Team, along with workshops and artist discussions. Opened in 1929 as Atlantic City Convention Hall to host city’s growing convention industry, but substantial debt from construction and subsequent stock market crash and Great Depression contributed to City's fiscal crisis in 1930s. $90 million renovation and restoration completed 2001, renamed Boardwalk Hall after opening of Atlantic City Convention Center. Current capacity of 14,770 for concerts; seats 10,500 people for ice hockey, Home of Miss America Pageant since 1940, except for 2005-2014 relocation to Las Vegas, issues over 2019 location due to divisions with Pageant organization, termination of subsidy by Casino Redevelopment Authority. 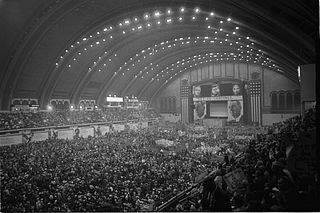 Hosted Democratic National Convention in 1964, declared a National Historic Landmark in 1987. Contains world's largest musical instrument, a pipe organ of over 33,000 pipes. Performers have included the Beatles, Rolling Stones, Bruce Springsteen, Beyonce, Lady Gaga, Britney Spears, Madonna and many others. Adrian Phillips Theater located on concourse level houses stage with proscenium opening and open air loggia overlooking beach and boardwalk, with capacities ranging from 1,000 in rounds to 3,200 in theater style, events include concerts, boxing, dance and theatrical functions. Main theater of casino-hotel with theater-style seating for 1,600. Performers have included Smokey Robinson, Crosby, Stills & Nash, Diana Krall, Reba McEntire, Donny & Marie, Seth Meyers. Theaters include Event Center with seating up to 2,400 and Music Box 1,000-seat theater designed for concerts ranging from jazz to metal to country to blues. Performers have included The Rolling Stones, The Who, Eric Clapton, David Bowie, Jay-Z, Mariah Carey and Sting. 1,350-seat Superstar Theater and 300-seat Screening Room Theater. First casino-hotel to open in Atlantic City in May 1978, opening act Steve Lawrence & Eydie Gorme, with Lawrence throwing out first dice roll at one of craps tables. Broadway-style theater with 2,000 seats, largest showroom in Atlantic City. Features music headliners, revues, sporting events, and Broadway productions. Hotel also houses IMAX advance projection movie theater. Operated by Stockton University, features plays, poetry readings, music primarily by students and local performers. Capacity of about 200. Located in historic “Ducktown” Italian-American neighborhood of Atlantic City, originally built in 1926 by St. Michael’s Catholic Church as church hall, school gymnasium, and community theater. After parish school closed in late 1980s, building remained vacant until $3.5 million renovation funded by Casino Reinvestment Development Authority completed 2003, with building renamed “Dante Hall Theater of the Arts,” In 2011, Stockton University took control of theater. Equity professional theater company founded 1980, first theater in US created with focus on presenting and preserving America's theatrical heritage. Past productions include plays by Rachel Crothers, George S. Kaufman, and Eugene O'Neill, as well as new works based on American literature and history. Artist-in-residence programs in schools and summer theater workshops in acting, playwriting, and production. Touring shows travel throughout country. During Cape May Performing Season (March and June through December), in residence at First Presbyterian Church of Cape May, block away from beach. Founded as private summer arts camp in 1960 by musicians and arts educators Albert and Clare Appel. Later expanded to year-round programming on 117-acre site with arts education programs and workshops for adults and children, outreach to schools and community-based partnerships. Continues to sponsor summer camp for children aged 7–17 with sessions in Visual Arts, Photography, Music, Theatre, Creative Writing, Dance, Video and Horseback Riding. Also hosts conferences, retreats and private receptions from September through May. 500-seat theater on Cumberland County College campus situated in larger conference center. Presents professional and student productions, including concerts, dance, plays. Completed in 1998, 2,400-seat Center originally designed as Washington Township school district's high school auditorium, prior to opening theater concept refocused also to host large-scale productions for region and community. Hosted national tours of such musicals as "Fiddler on the Roof," "The Pajama Game," "Crazy For You," "42nd Street" and "West Side Story," Performers have included Tony Bennett, Willy Nelson, Gladys Knight, Chaka Kahn, Paul Anka, Lewis Black, George Benson, BB King, Andy Williams. Regional and community arts organizations include Marcia Hyland Dance & Arts Center, All That Jazz Philadelphia, The Dance Connection and The Dance Factory along with national dance and talent competitions. Official name Walter K. Gordon Theater, located on Rutgers-Camden campus. 650-seat proscenium theater with no obstructed views. Rutgers-Camden Department of Fine Arts stages plays and choral performances throughout academic year. Performance home for Symphony in C --one of three professional training orchestras in US. Programs include singing and dancing performances by school students from City of Camden and surrounding region. Outdoor amphitheater/indoor theater complex on Delaware River in Camden Waterfront district which also includes Battleship New Jersey and Adventure Aquarium. 25,000-person capacity outdoor amphitheater during summer, also lawn with video screens and computerized sound enhancement In fall and winter, converts to fully enclosed, flexible-capacity theater for up to 7,000 people offering variety of concerts, theatrical productions, and family entertainment. Formerly Susquehanna Bank Center, renamed 2015 after acquisition of Susquehanna Bank by BB&T financial firm, also previously named since 1995 opening as Blockbuster-Sony Music Entertainment Centre and later as Tweeter Center.